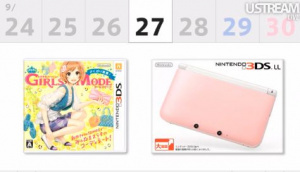 Nintendo has confirmed the release of a pink and white 3DS XL console. The system was announced during today's Nintendo Direct video. Called the 3DS LL in Japan, the new hardware is due to launch on 27th September, along with the excellently-titled Wagamama Fashion Girls. Admit it - you want one. Betta start saving up those pennies! ARGH why did they go back to the gross birth-control-case pink from the DS phat days that nobody liked? : I guess it's better than nothing, but bright pink a-la DSi or the purple that 3DS regular got for no reason would be better. 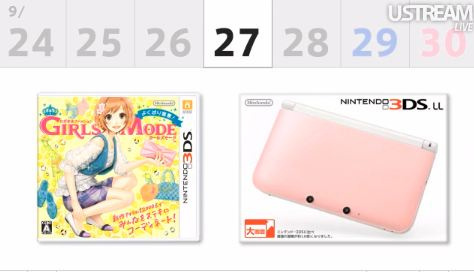 Girls Mode is a strange title for a game,it must be for feminine Japanese men. Just my type of game then. Or little girls, there was a similar US only game. Nope. Don't care for pink. Now green would make me envious (see what I did there ). My blue XL is lovely enough. The white really doesn't go well with anything I don't think (just like the Pikachu one). It'd look much better as pink and black. Omg, no: that would look like an old, tiled bathroom! Lol. @R-L-A-George I think I know what game you're talking about,Style Savy,I remember it being a really good game. Yes I admit it,I like fashion games. Why? Who wants that horrid pink when there other better color options? My wife has the pink 3DS that came with Nintendogs n Cats last year so I could see her upgrading to this one. I wonder if the XL will fit in her Mario pouch (free from Club Nintendo)? (sigh) Where's mah platnim and blak!?! I'll never understand how girly-ish games from Japan I'm all: "I really wanna get it!" But when it comes here in America I'm all: "ugh, this looks terrible!" Eh... I would prefer Pink and Black but Pink and White is nice too. Very excited for the new Style Savvy! They should announce newer colors for the U.S., too. Is this all they announced? There's NOTHING wrong with liking titles/colors outside of your target demographic!!! Don't let other people bully you for liking things they don't like. We do not live in a world that is one-size fits all. Titles and colors are MARKETED towards certain gender demographics because the supplier feels it will sell more there. They are just trying to capitalize their profits. Buying something pink or playing a fashion game does not make a boy a girl. Life is short, enjoy what makes you happy! @BenAV: Noooo anything but the black part! I hate it on the current colours. This is the next closest thing to the Japanese white.